Is America witnessing the re-emergence of “Jacksonian” politics? With increasing regularity, pundits are harkening back to the cultural and political movement that brought frontier General Andrew Jackson to the White House in order to explain the changes taking place in the Republican Party. The hero of the Battle of New Orleans is more relevant than ever, it seems. Steve Inskeep, a journalist and historian who wrote Jacksonland: President Andrew Jackson, Cherokee Chief John Ross, and a Great American Land Grab, claimed that Donald Trump’s campaign was channeling Andrew Jackson in a recent New York Times op-ed. Inskeep is correct that many regions that sided with Jackson in the 1820s and 1830s are where Trump is currently successful and that they will have a large impact on the 2016 presidential race. However, he distorts Jackson’s record and creates a liberal caricature of what motivates Jacksonians and conservatives in general. He insinuates that Jacksonianism is little more than cultural impulse and the desire to create “an America for white people.” This makes a hash of what is an incredibly important american political tradition—which is larger than pure identity politics. Far from being a cultural tic or simple anger at outsiders, Jacksonianism properly understood has a solid foundation in principles that trace back to the founding—and it has a much larger appeal than the confines of Appalachia. The Jacksonians had three core principles: the rejection of a crony capitalist alliance between big business and big government, disgust with a permanent political class in Washington wedded to the benefits of those cushy deals, and a belief that they were restoring virtuous, republican institutions guided by the principles of the Founding—with an emphasis on strictly limited government and federalism. Jacksonians had a deep and unrelenting faith in the virtue of the American people to restore their republic to the one the Founders had intended. The Tea Party, which exploded on the political scene in 2009, is the inheritor of the Jacksonian mantle. The movement launched in the wake of an economic collapse and in opposition to the crony capitalism of the Wall Street bailout. The small business owners, retirees, ex-military members, and PTA moms of the Tea Party rejected the notion that they ought to pony up for the mistakes of Wall Street or their neighbors’ too-expensive mortgages. The movement focused on fighting the crony capitalism evident in the TARP bailouts, trained its fire on Republican incumbents who talked a good conservative game in their districts but voted for ever-growing budget deals, and championed restoring proper limits to the federal government. Their concerns would have been familiar to those who organized for Jackson in the Presidential elections of 1824, 1828, and 1832. In the 1820s there was essentially only one party in America—the one founded by Thomas Jefferson and James Madison—but serious policy differences were arising within that party. A political consensus dominated the capitol after the collapse of Alexander Hamilton’s Federalist party in the early 1800s. National politics had become an insider’s game, with plenty of intrigue behind closed doors and far away from the public eye. The party consensus was to promote an “American System”: a national system of infrastructure designed to bind the union together economically, funded by tariffs, high-priced western land sales from the Louisiana purchase, and the Second Bank of the United States (BUS), a quasi-governmental organization—much like the modern Freddie Mac and Fannie Mae, the institutions whose malfeasance in the 2007 housing crisis helped spark the rise of the Tea Party. Like their counterparts in the 1820s and 30s, the Tea Party reflected a growing popular belief that the federal government was becoming corrupt and there was too much power concentrated in Washington D.C. The so-called Era of Good Feelings, as the time between James Madison’s presidency and John Quincy Adams’ has been called, was thought of more as an era of corruption to Jacksonians. They believed that the party of Jefferson was being taken over by old Federalists, ushering in an age of big government and widespread federal patronage. Though Jackson and many others initially gave support to elements of the political consensus in favor of national infrastructure building, they began to see it more as a corrupting influence on the republic. In their minds, the increase of power in the nation’s capitol was creating a privileged ruling class. The American System was becoming more of a system of logrolling and patronage rather than a project for the national good, and the BUS was siphoning off the people’s money into the pockets of bureaucrats, businessmen, and politicians. Many of those who pushed for the American System were blind to the fact that large infrastructure projects increasingly didn’t need government investment anymore. The capitalist economy was flowering and exploding by private means—Jacksonians believed the agreement between politicians and big business that drove the American System push threatened to corrupt the republic and create plutocracy. While they often railed against the abuses of big business in collusion with big government, Jacksonians were not leftist levelers. They believed staunchly in in the idea of equal opportunity for all, special favoritism to none. This idea of justice was best exemplified in Jackson’s message when he vetoed the Bank of the United States charter. It is an eloquent attack on crony capitalism that was echoed by a Tea Party-influenced panel moderated by Breitbart News at CPAC 2015. Predictably, this message was about as well-received in Washington as it has been in our own time. Jackson’s coalition of voters, and their cleansing, democratic message, was broadly maligned by the elite of the nation’s capital as the product of an unthinking rabble reacting to Jackson’s battlefield renown. Modern grassroots Republican voters would understand Benton’s refrain. The party establishment has taken their votes for granted, looked down on them, and ignored their pleas for a change of direction. But merely being opposed to the establishment’s failure and elitism does not accurately describe what the Jacksonians stood for. The outsider, populist message of the Jacksonians jeopardized the gravy train that many in DC had become accustomed to, by threatening to seriously limit the favors government was able to hand out. They were not merely culturally anathema to the establishment class, but a very real and principled threat to the way of life in Washington that had built up in the past decades. The party establishments, Democrat and Republican, fear Cruz over Trump for exactly this reason: his Jacksonian principles stand in direct contradiction to the way they are accustomed to doing business, while Trump just forces them to make room for a new lead dealmaker. 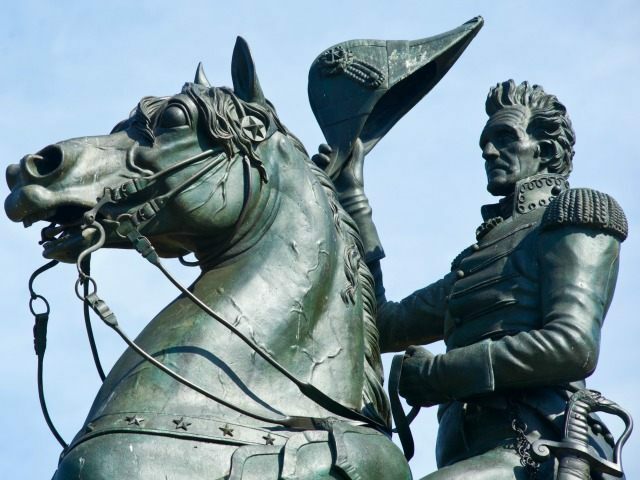 Old Hickory may have been a war hero and a celebrity when the country elected him president, but this did not mean that he lacked core principles that guided him in office. Jackson’s election in 1828 was a culmination of a long-term push by party organizers and a number of public intellectuals to bring ideas to the people rather than simply give them a water-down choice between personalities. Today, after years of crony capitalism, growth of government, and unconstitutional executive overreaches, the time is ripe for a Jacksonian outsider wave to shake up politics in Washington. But is there anyone who can capture this vote and sweep into office with the true Jacksonian reform agenda in mind? In 2016, two major Republican candidates have channeled Jacksonian concerns in their own way—Donald Trump and Texas Senator Ted Cruz. Both Trump and Cruz have both been relentlessly focused on issues that Jacksonians currently care about most: border security, immigration, and defeating radical, global Islam that threatens Western civilization. And both have sounded strongly Jacksonian tones when it comes to defense of Americans without the nation-building ideas associated with the George W. Bush administration and current Republican candidate Sen. Marco Rubio (R-FL). But there are some clear, fundamental differences in their overall messages. While Trump has captured much of the cultural zeitgeist of 21st century Jacksonianism, Cruz adheres to true Jacksonian principles. Tea Party Patriots Citizens Fund Chairman Jenny Beth Martin said in her endorsement of Cruz, “We seek a candidate who shares our values: personal freedom, economic freedom, and a debt-free future.” Among those looking for a candidate who “shares my values,” Cruz received 34% in South Carolina to Trump’s 8%, according to exit polls. Trump is the best at communicating culturally to a frustrated Jacksonian Appalachia, but many of his solutions are far from Jacksonian. In sharp contrast to the historical Jacksonians, who promised only the freedom to rise rather than a piece of the corrupt action, a fundamental part of Trump’s message has been that he’s looking to get the system to take more account of “his people.” This is why he is spoken unashamedly of his record buying politicians, wheeling and dealing, eminent domain usage, and other crony capitalist moves that would have horrified the Jacksonians. He is looking to join the game, and the promise is that he will get a piece of it for his supporters. Cruz has crafted a very strong Jacksonian message based on limited government, the power of free enterprise, and the need to return to constitutional restraints. He’s even hit other, more limited issues that nonetheless appeal to Jacksonians—such as turning over federal land to the states and the American people. He fights crony deals and the establishment class, which is what most Jacksonians really want. But he has as yet failed to connect on a deeper level to Jacksonian voters because of his style. Cruz would do better to change his demeanor, which is too academic to appeal culturally to Jacksonians. His message may be the true Jacksonian one, but he would help himself enormously if he stopped trying to make the most calculated answer and instead aimed for the most direct one. For instance, when Donald Trump threatened to sue Cruz for slander before the South Carolina primary, Cruz came out with a long, lawyerly defense of his actions. He would have been much better served if he challenged Trump’s manhood (Andrew Jackson’s mother gave him two pieces for being an honorable man: “indict no man for assault and battery, nor sue him for slander”), tied the threat of lawsuit with the “New York Values” theme, and totally dismissed the attack as nonsense. He could have won over some supporters, but instead merely held serve. The closest modern comparison to the Jacksonian outsider hero sweeping the nation is Ronald Reagan, who combined Trump’s communication skills and cultural resonance with Cruz’s Jacksonian political philosophy. It is no slight to current candidates to say that a man of Reagan’s stature has not quite emerged—which is not to say one will not over the course of the campaign. The future of the Republican Party will likely be Jacksonian, but this does not mean it will be successful. The party can follow the shallow facsimile of Jacksonianism that is reflected in the analysis of the New York Times, and attempt to grab a place for Jacksonian America at the corrupt feast in Washington. Or, it can choose to embark on the path blazed for it by the true Jacksonians, initiating the beginning of a long-term revival of Constitutional republicanism.